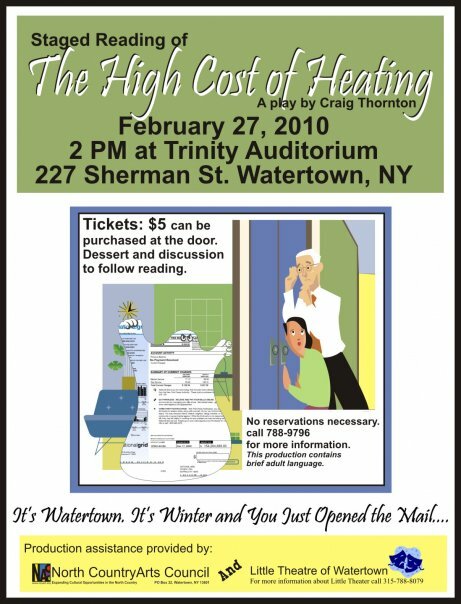 Posted on February 27, 2010, in News and tagged Craig Thornton, Heating Bills, The High Cost of Heating, Watertown NY. Bookmark the permalink. 4 Comments. I love the analogy between the bills and relationships. I did live in tropical,sunny paradise on earth St Croix USVI. My dream is to make enough money one day,return there and, sit under a coconut tree with a good book and a jugwine:_)listening to the Caribbean Sea play with the sun. Meanwhile I have to endure this brutal climate!and sky high heating bills. Rock on! I’m totally wishing I didn’t have to sit up here in the snow, either. Someday…St. Augustine. For now, Connecticut, where when the snow falls it looks like lice. You are the bomb, Craig!! It was my pleasure. I loved that opening scene and I really WOULD love to read the whole thing…especially since now the bill gets chucked in the closet. Awesome. If there’s any way you could some day shoot me the whole thing just to read, I’d love it. Thanks for your promotion and insight of my work.